Charcot neuroarthropathy, more commonly just referred to as Charcot, is a condition which affects individuals with neuropathy which is a metabolic dysfunction in the nerves leading to decreased sensation in the extremities, and in this case the lower extremities. There are different theories as to how this condition works. One of the theories is the French theory which suggests that the bones in the foot get washed out because there is too much blood flow to the foot at times because the flow is not regulated correctly by blood vessels because of the defect in nerve function leading to micro-fracturing of the bones which do not heal properly from normal everyday use or in some cases acute trauma that results in a breakdown of the bone. The other theory is the German theory which suggests that the nerve dysfunction does regulate proprioception in the feet correctly and this decreased musculoskeletal feedback causes excess trauma on the bones and joints of the foot. This excessive trauma will then lead to a breakdown in the overall structure and a collapse of the joint to the foot, most often the midfoot, as this is the point of the foot with the most stress typically. The newest and more accepted is a combination of the two theories in which a factor of poorly regulated blood flow and decreased proprioception from nerve dysfunction that allows the breakdown in the overall structure of the foot to occur, which leads to the deformity known as Charcot. This typically occurs in diabetic patients due to poor or lack of blood sugar control, which allows nerve function to continue to deteriorate. This can occur with any individual who has neuropathy regardless of the underlying cause. Initial treatment of this condition is focused on support of the foot and ankle bones and soft tissue as they transition from the acute phase to the consolidation phase. As the foot transitions there is a lot of destruction of the bone and joints that can occur leading to a breakdown in the structure of the foot especially at the arch, similar to that of a falling bridge where most of the damage occurs at the highest point of stress. During this time the foot and ankle are supported with a CAM walking boot (pictured left), and walking cast also known as a total contact cast (pictured center) or a customized boot called a CROW (Charcot Restraint Orthotic Walker) boot (pictured right). Early detection is key to successful conservative treatment. However, because the underlying cause is due to neuropathy (lack of sensation), many times the condition is not recognized by the individual because they do not experience pain during the process. The condition easily progresses to a point where the foot is collapsed and pressure points present themselves in the center of the foot where the foot collapsed, predisposing the individual to pressure wounds also due in part to the lack of sensation. When this occurs the wound must be healed with wound care in conjunction with off-loading of the area with one of the above-mentioned devices. 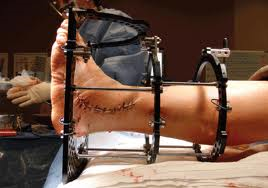 The final step in treatment would be surgical reconstruction of the foot or ankle, which in most cases involves both internal fixation of the bones and external fixation with a frame (pictured below). 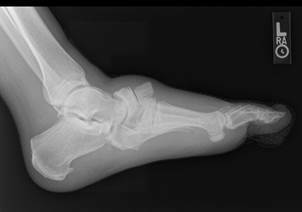 The following images are plain x-ray films of individuals who had Charcot deformities occur, which then causes significant problems with ambulation and pressure and abnormal aspects of the foot and ankle that lead to pressure ulcerations, further complicating the overall picture and the patient's health. Once Charcot arthropathy occurs it has phases beginning with the acute phase, which is the collapse of the foot or other involved joint, then the quiescent phase in which the process begins to slow down and the coalescent phase, which begins to stabilize the bones and joints in the position that they end up in. It is important to address this condition if possible before this phase occurs to allow correction of the deformity and the body's natural tendency to heal the process with the foot in the corrected position. 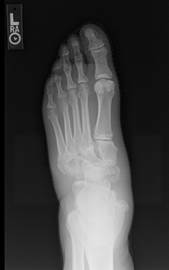 In the picture below one can see the bone in the middle of the foot pointed upward and displaced because of the breakdown of the middle of the foot. 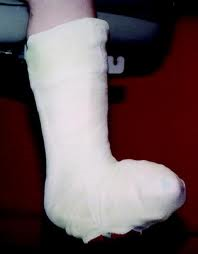 The bone (cuneiform) has to be put back into position and held in that position to allow healing. 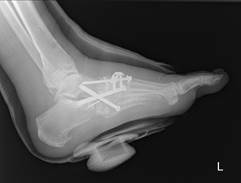 Below are images of Charcot deformity in the midfoot and reconstructive surgery involving an external fixator, which is the metallic structure that you see outside of the area of the foot and leg with pins inserted into the foot and leg to allow support and reduction of the deformity to allow healing. 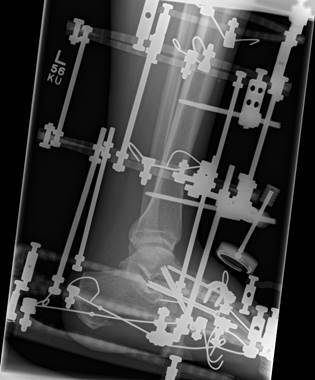 The lower images are after the removal of the external fixator apparatus, allowing clear visibility of the reconstruction of the midfoot, involving internal fixation with screws and a surgical plate. Notice the reduction of the previous displaced midfoot bones and a recreation of the midfoot arch. The images below are that of Charcot of the ankle joint. This patient had a wound to the inside of his ankle as he would walk and put pressure on the inside of his ankle because the foot was displaced outward. 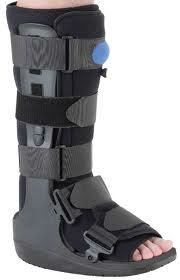 The patient had a previous ankle fracture that was repaired. However, because of the onset of Charcot neuroarthropathy, the weakening of bones did not allow the structure to hold up after the repaired ankle fracture, causing the breakdown seen in the images. 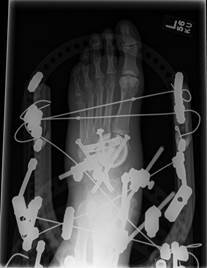 One can see that excessive stress is taken on at the ankle and the screws holding the tibia and fibula together broke. 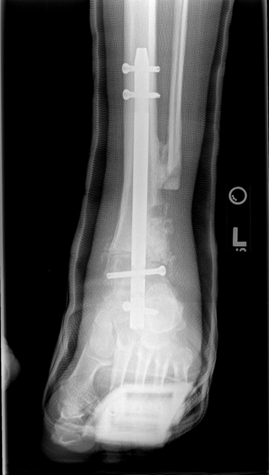 After over a year of wound care to help the wound on the inside of the ankle heal, the patient was finally stable enough to have surgery to realign the foot underneath the ankle, requiring a fusion of the ankle and subtalar joint with a surgical nail (rod).